Pannetone Bread Pudding – Magnifico! 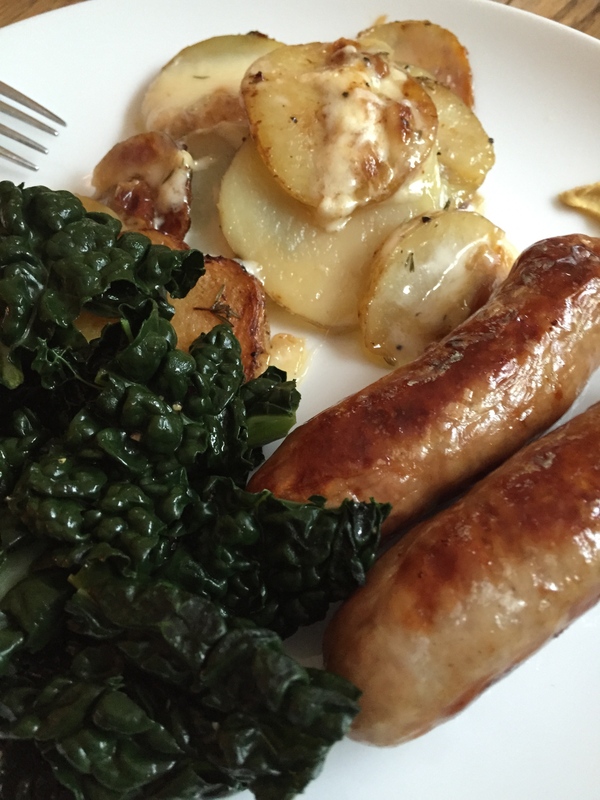 A great way to use up those left over pannetones that are lingering in the cupboard post Christmas! Experiment with the different flavoured ones!! A favourite of my daughter’s! Scrumptious! You could serve with cream but it is really creamy enough!! Preheat the oven to 160C / fan 140C and grease a 850ml/1½ pint shallow baking dish with a little butter. Cut the panettone into wedges, leaving the crusts on. Butter the slices lightly with the rest of the butter. Cut the slices in half and arrange them in the dish, buttered side up. Put the dish in a roasting tin and pour hot water around it to a depth of about 2.5cm/1in. Bake for 35 minutes until the pudding is just set – it should be yellow inside and nicely browned on top. Dust with icing sugar. Supper last night and I was in the mood for chicken…and for pasta…and I had some cream left over and a red pepper…so it had to be this dish…simple and such a refreshing change. 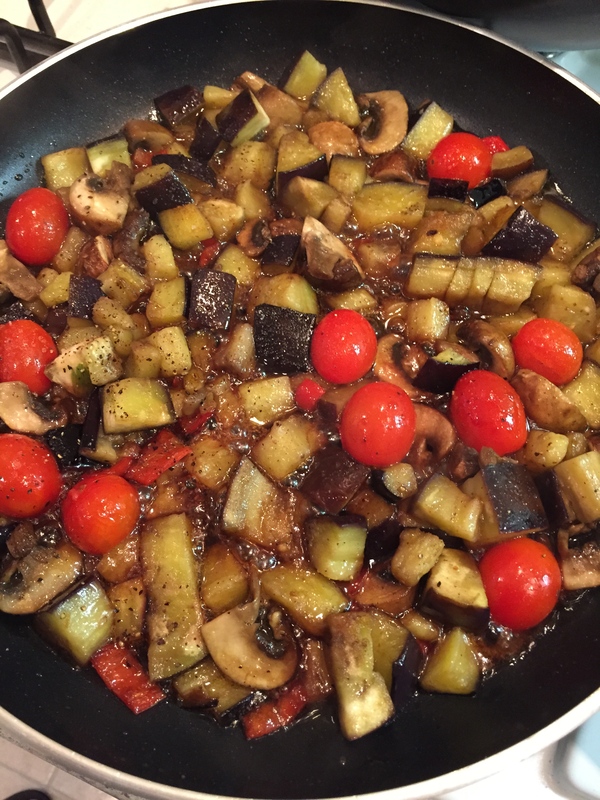 Heat half the oil in a large deep pan – a non stick wok with a lid would be dandy – or a stainless steel casserole pan. Add the onion and fry gently over a lowish heat for about 5 minutes until soft. 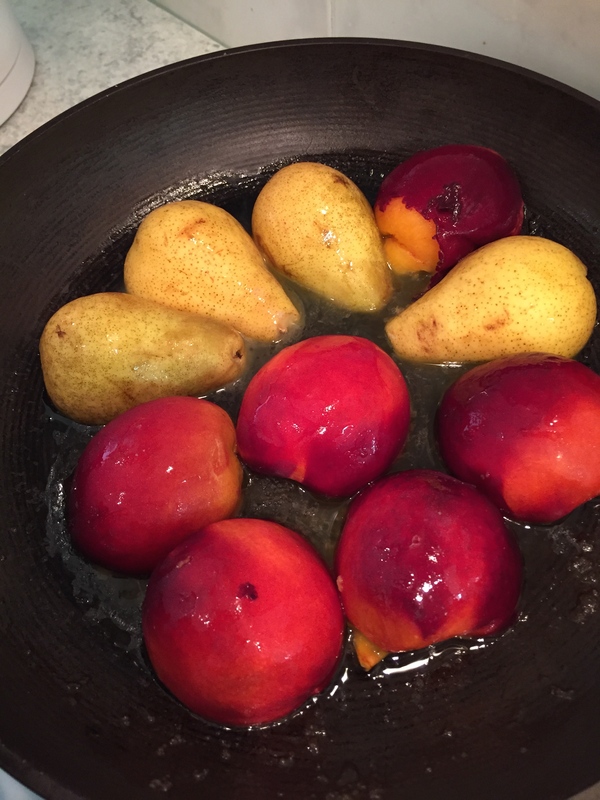 Remove from pan into a bowl and put to one side. Add the remaining oil – add the chicken – raise the heat to medium and brown the chicken for around 6-8 minutes. Return the onion to the pan with the garlic and the dried chilli. Pour in the wine and let it reduce by half. Add the red pepper slices. Season with salt and black pepper. After 4 minutes stir in the tomatoes. Lower the heat, cover the pan and cook for around 25 minutes. Stir occasionally. Remove the lid and stir in the cream. Add the chopped parsley and after a minute or so – serve with pasta. A colourful southern Italian dish with more flavours than you could imagine. 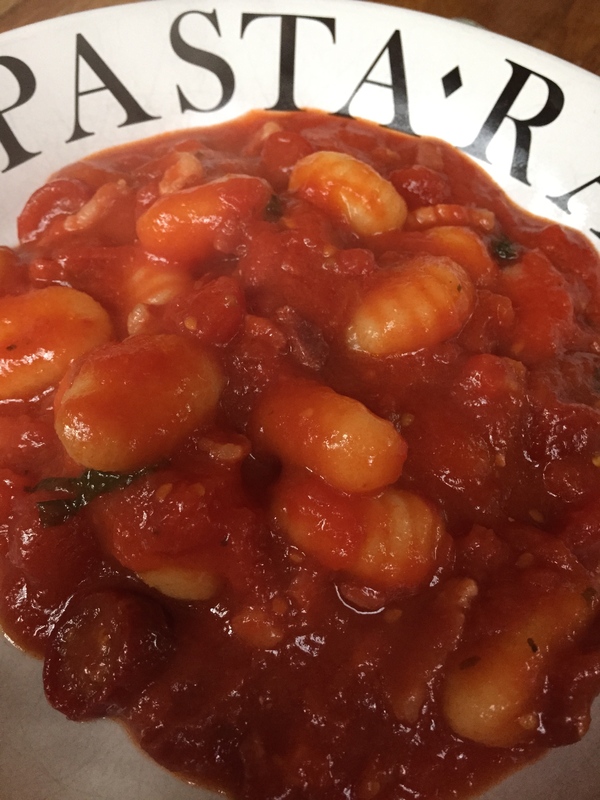 This is a great way to eat gnocchi – it is a warming dish that looks wonderful, smells divine and there is enough here to feed 4 though I made it for two of us and there is just a small bowl left! I couldn’t help going back for just a little bit more! So easy to make too! A small handful of basil leaves and their stalks. A splash of red wine. 4 sundried tomatoes cut into strips. Add a good splash of olive to a pan, the garlic and the basil, including the stalks all finely chopped, and heat gently. Now add the pancetta or lardon. fry for a minute or two until they begin to brown, then add the tomatoes. Bring to a gentle simmer, and add the jalapeños and the sun dried tomatoes. You could add a little tomato sauce or puree to taste but if your tinned toms are good quality you shouldn’t need anything. Stir well and bring to a gentle rolling boil then turn right down – add a dash of red wine and leave to simmer for about half an hour until the sauce begins to thicken. Near the end cook the gnocchi in boiling water for two minutes – drain – and add to the sauce. Leave on a low heat for another ten minutes to allow the gnocchi to soak up the flavours. 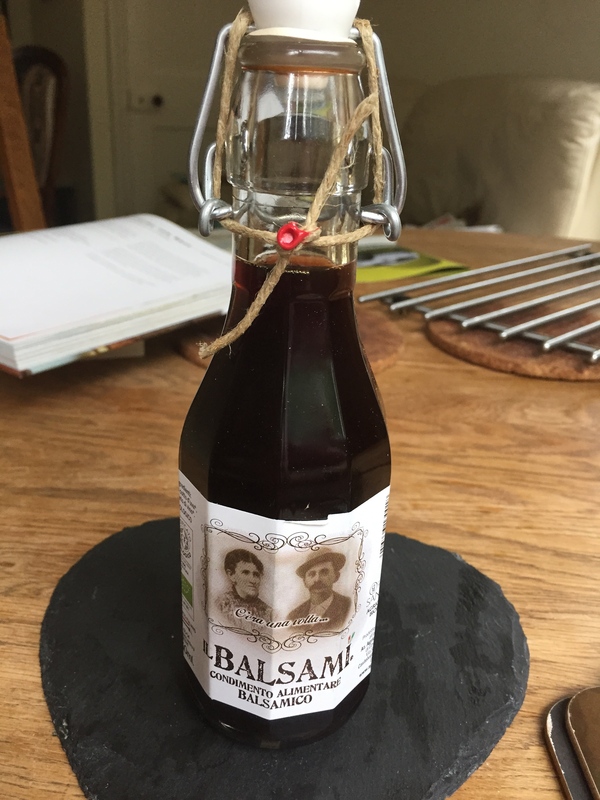 You could use balsamic instead of red wine of you wished or leave it out altogether – tis up to you! Serve in bowls with a light green salad. Sea Bass and eat it! Possibly one of my favourite fish – creamy, succulent sea bass – so easy to cook and the flavours are immense. This dish brings out the best in the bass – easy to cook and a super light lunch or early summer supper. The fennel also just bursts into life in this dish. 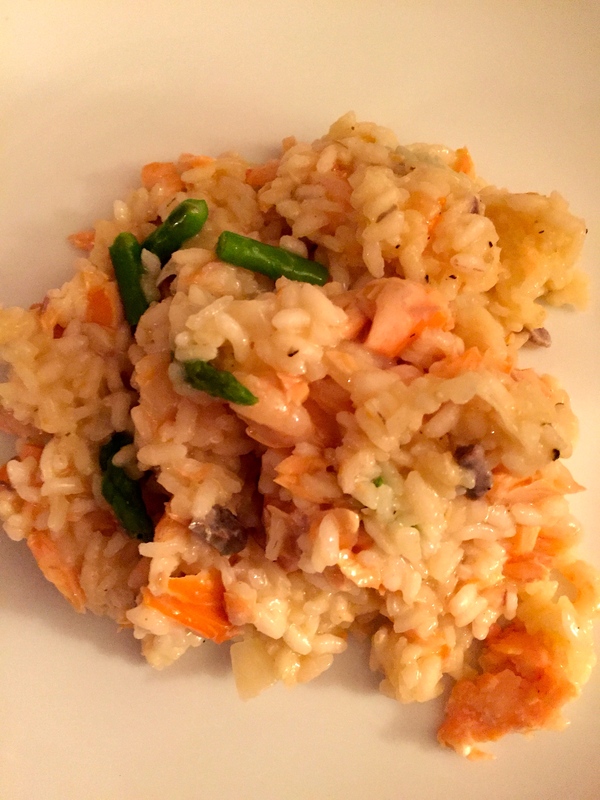 You could use other fish – and you could pimp the dish by adding king prawns – but this basic recipe hits the spot for me! Preheat the oven to 180c. 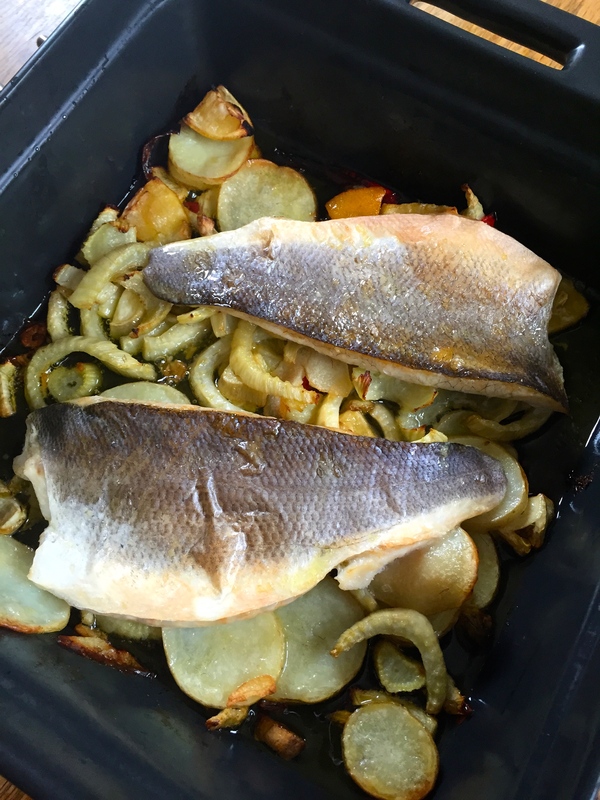 Splash olive oil in a roasting tin snug enough to fit the fillets. Add the fennel, garlic, potato and lemon plus the chilli strips. Stir to coat everything. Place in the hot oven for 30 minutes, stirring half way through. Meanwhile, make 3 cuts in the skin of the sea bass, and sprinkle with sea salt. When the 30 minutes is up, remove dish from the oven and sprinkle a little sea salt over everything, then add the fillets, skin side down on the top of the mixture. Drizzle the fish with a little more olive oil, then return to the oven for 20 minutes. This has been one of my favourite lunch dishes so far this summer – I hope it becomes one of yours too! 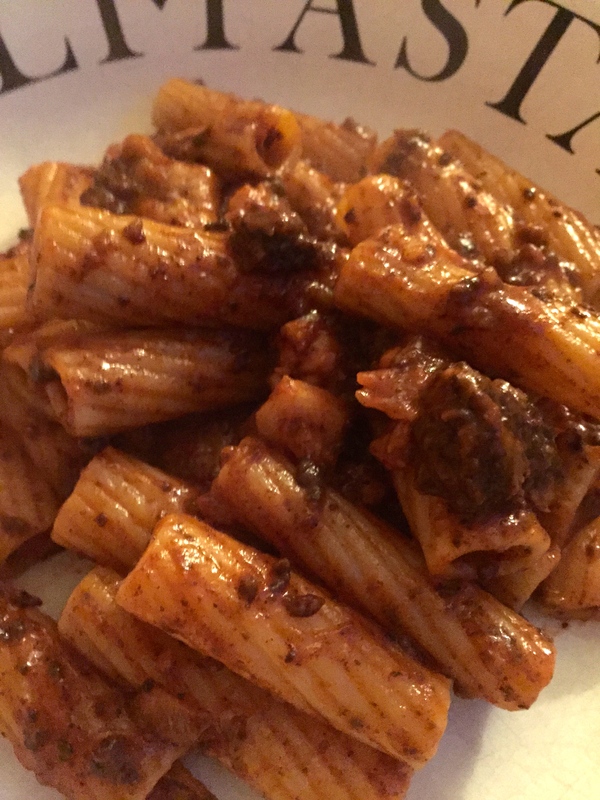 This is a richly satisfying, luxurious pasta dish and a great way to eat the mighty black pudding. I adore the stuff. It goes well with the pasta and the sausages and looks velvety dark on the plate. Be bold and brave – give it a go as soon as possible! 1 small onion peeled and chopped. Heat the oil in a large pan, and fry the sausage meat, stirring and breaking up the pieces. After the juice from the meat has evaporated and the fat begins to run, add the onion, garlic, chilli, rosemary bay leaves and a little grind of sea salt and black pepper. Cook gently for almost 30 mins until the onions are browning. Add the black pudding. Stir for about five minutes to let the black pudding cook and crumble slightly with the sausage mixture. Pour in the wine, increase the heat and cook until the wine evaporates. Now add the passata, lower the heat, and simmer gently for about 30 minutes. Cook the pasta and drain well. Add the pasta back to its pan and stir in the sauce mix then serve to a hushed reverence! 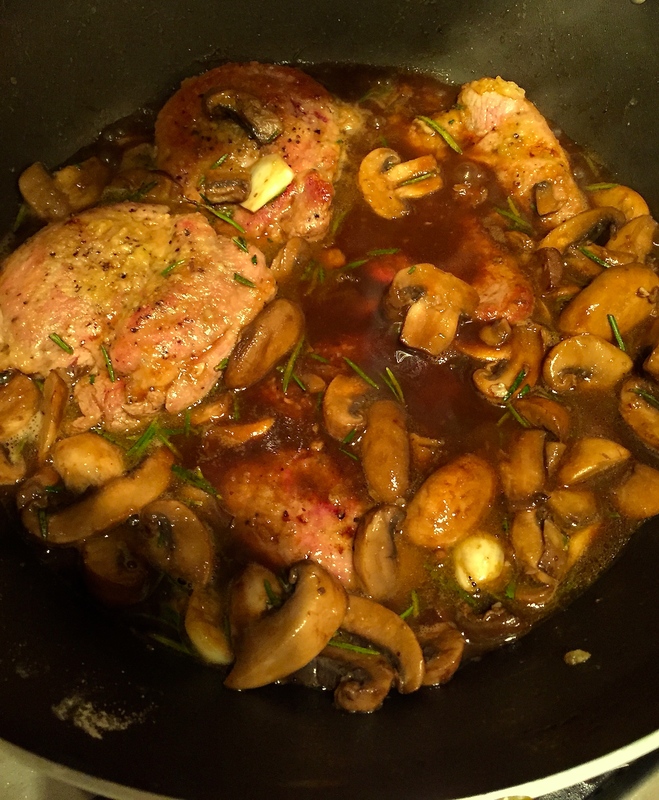 Lamb escalopes with mushrooms and white wine – divine! 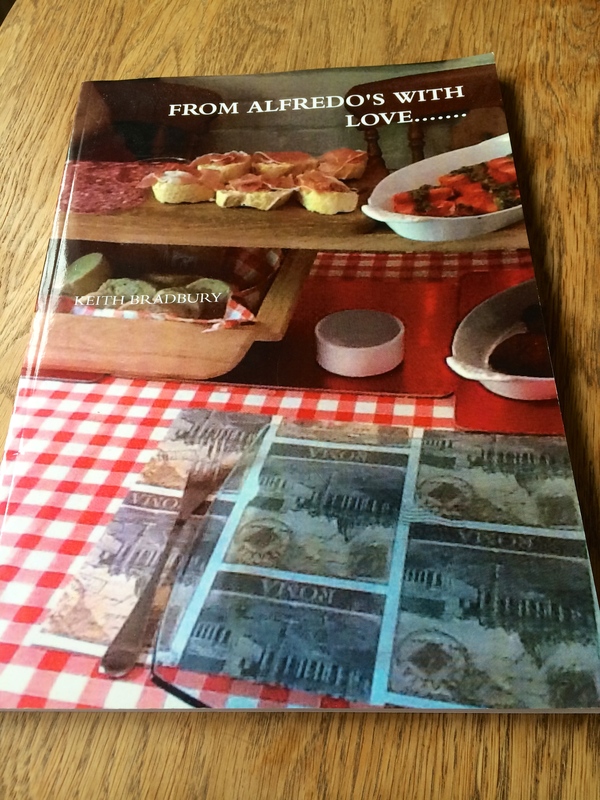 I came across this slice of heaven in an Italian cook book and it quite rightly states that, although it only takes around 20 minutes from start to finish, guests will think it took ages. 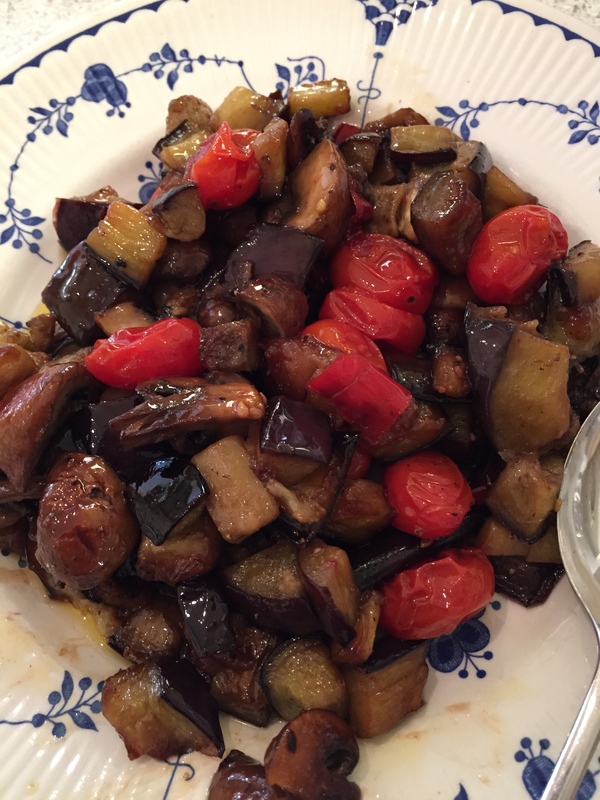 It is a really fine supper dish and needs little accompaniment other than a good dark green salad and hunks of crusty bread. 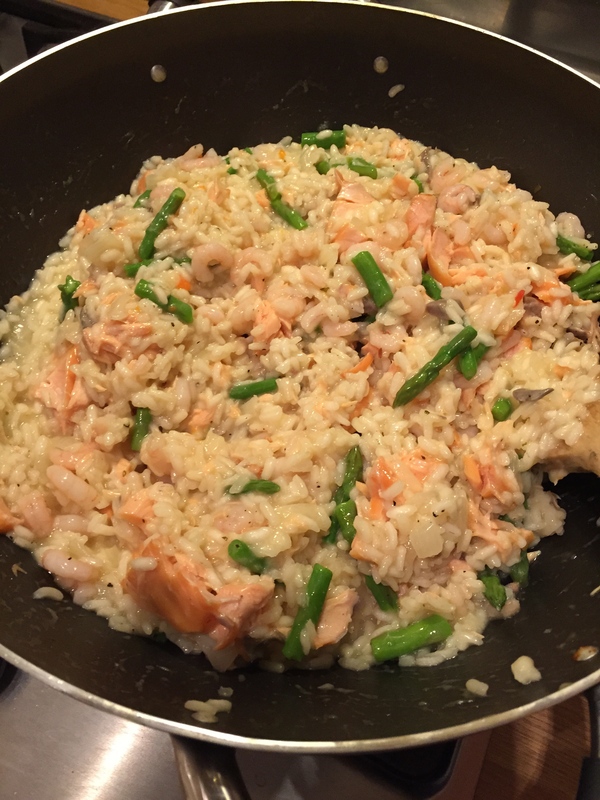 My son was still talking about this dish 24 hours later – a very good sign – he loved it… and I have no doubt that you will too. It is a wonderful dish. And the mushrooms are central to this fabulous rich stock – we need to eat more of them! So good for you too! They are low in fat and calories with typically less than 0.5g fat and 15 calories (kcal) per 100g. 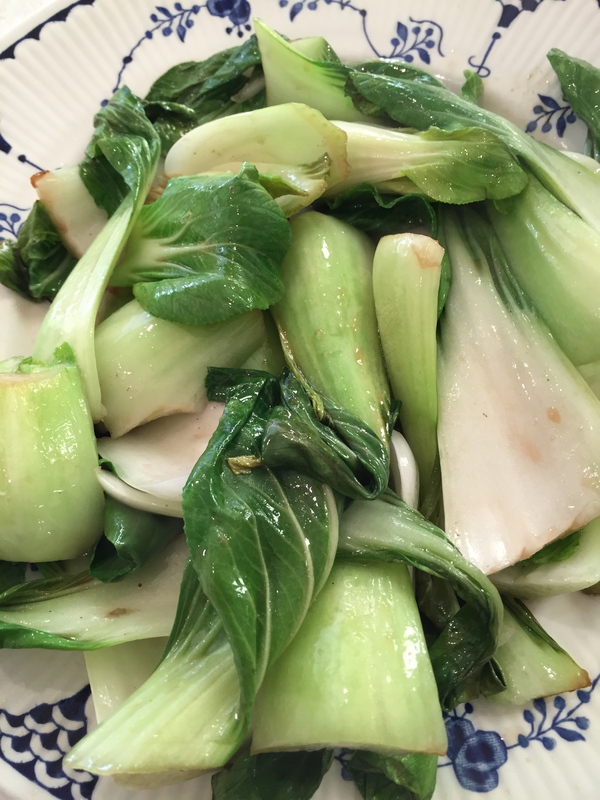 They are a source of folic acid and niacin – great for a healthy nervous system. They are also a source of pantothenic acid for healthy mental performance. So if you want to keep your brain ticking over – eat more funghi! 300 gm of your mushroom of choice – wild would be good – I used forestiere – a new variety with a gorgeously nutty, buttery flavour. Pop the lamb steaks between layers of cling film and bash until they are flattened to about 2mm. Remove them gently, season both sides with the salt and pepper, then dust with the flour on both sides. Leave them to one side. Heat 4 tbsp of oil in a large frying pan and add the garlic and rosemary on it is hot. Fry for 30 seconds then add the mushrooms. Fry, stirring now and then, for a further 3 minutes. Have a warm bowl handy and slide the mushroom mix into it and keep to one side. Wipe the frying pan and add 4 more tbsp of olive oil. Once the oil has heated add the lamb steaks and fry over a medium heat for one minute per side. Pour in the wine and let it bubble for a minute, then add the mushroom mixture plus the stock. Stir gently around the steaks for 3 minutes. Now add the butter. 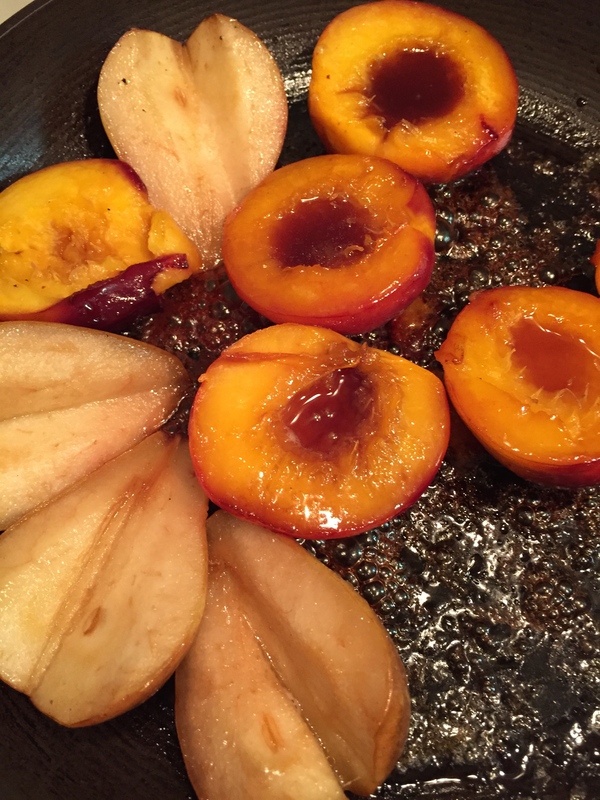 Stir for about 30 seconds – the sauce will thicken and take on a wonderfully rich hue. Pop each steak on a warmed plate – then add a serving of the mushrooms and sauce to each. Stunning!